So recently (well, late February) I got into Undertale and I swear to God that game is making me rethink about how I play games. I'm serious, right now... I'm too scared to do the genocide route as I heard once it's done, I live with those sins forever. I'm not saying that 'Undertale beats any other game out there' or 'Undertale beats any other fandom out there'. All I'm saying is that I've become addicted about the effect that game has caused me and it's a good thing as it changed my perspective on video game tropes and conventions. But this game... I've became trash under 4 days (4 DAYS!!!). It first started when I watched Dan and Phil played it in YouTube then I bought the game because it seemed fun! So I got the game and watched a few YouTube videos so I can get a basic introduction on what Undertale is about. Also, I watched Game Theory's episode about Sans and that got me hooked. Then after 2 hours of playing, I got the soundtrack because the music is very good. My fave songs are Home, Heartache, Another Medium, Undertale, Hopes and Dreams and Megalovania. Then there were the post in Tumblr and 4 hours in the game, I've became trash. This brought me to the point where I wanted where I wanted to write a Charisk (Chara x Frisk) fan fic on wattpad! But Undertale, I have to say, it's now one of my most fave games so far... even better than Pokemon (and I swear, I'm a total nerd for the GAMES [not the tv series]) and defeated my love for Skyrim (A game I played for 70 hours back in 2014/15!). Undertale will make you laugh, cry and think about your actions when controlling Frisk that right now, I'm now having second thoughts on doing the genocide route. If you want a quick summary of the story, click here. Another is the shipping. Anything can be shipped in the game. We have the usual ships, Chara and Frisk (Charisk), Sans and Toriel (Soriel), Alphys and Undyne (???). But we also have the odd ships which I accept like Monster Kid and Frisk, Mettaton and Papyrus, Papyrus and Undyne. Basically, if you can prove that your ship can be legit, then congratulations, it's accepted. The reason why I've became trash for Undertale in a short amount of time is something I'm still trying to figure out. I guess it's because the game is open to interpretation that the creative side of me wants to know more and wants to jump in into the action. I can just say 'Undertale is just a game and I enjoyed it' but the game broke gaming conventions where music is built to match the scene and the idea of saving and restarting can also affect the gameplay dialogue. It's breaking the rules on how video games work, reinventing the format on how it's play and changing how we experience playing video games. Normally, we play games like 'you need to do this' or 'you need to kill this dude' and it's mostly a linear timeline. 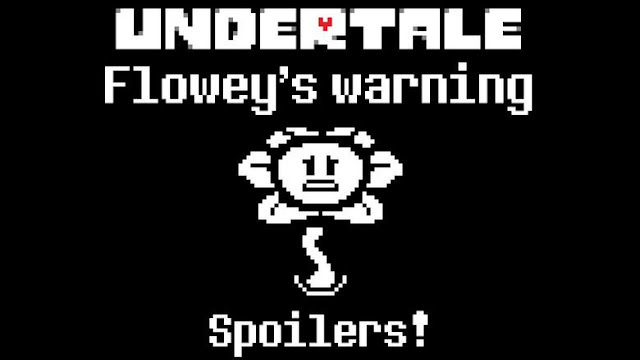 Undertale is also a linear timeline but it's more on a hierarchy timeline as each action can alter anything that can happen. This is what got me interested into the game, that one small step can change anything. The story can reach many ending and you are given the ability to expand on those endings and create new stories based on your experiences. Undertale is not just a video game, it's a game where you have room to expand the Undertale Universe as the characters you meet and encounter will leave a significant bond as you play the main game. To me, Undertale is Minecraft meets Skyrim, a game where your actions creates an impact on your character but you can build on the story further (hence why I'm writing a fan fic of the game in Wattpad). Toby Fox, if you are reading this (which I highly doubt you are), thank you for creating a game where our actions in the game creates an impact in the game and also creating a story where we can expand on. This game has to be the best game in 2016 (unless Pokemon Sun and Moon gives a better impression). So if you haven't played the game, I suggest you should as it's a fun game to play and it may be a bit challenging but the story in it will inspire you to create an extended plot line on what happens next. And the soundtrack is really good so I also suggest listening to that as well!